Aren't they just the most amazing looking birds!! Beautiful capture, Ray! Ray: Wonderful birds. 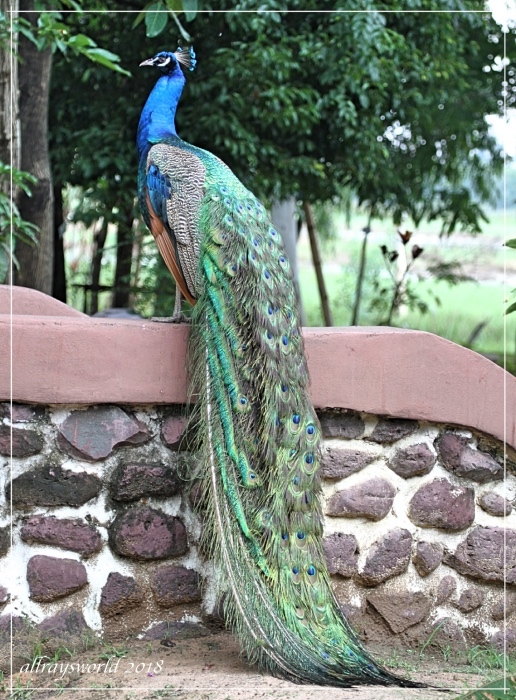 This one is the Indian Peacock, but a different variety is native to SE Asia. Ray: J'espérais qu'il montrerait pour moi, Martine, mais il n'était pas intéressé de le faire. I was hoping he would display for me, Martine, but he wasn't interested to do so. Ray: I tried making peahen-type noises to see if he would display his tail, but he wasn't fooled, Chris. Ray: This bloke had a big voice, Alan. Ray: There are feral peacocks running about in the Cotswolds, and terrorising our Chad, Bill. They are beautiful birds but also very noisy at times. Ray: Oh yes...they have a big voice, Brian. He is very beautiful in this position on the perch. Not the usual pose so I like it a lot. Ray: Up high so his tail is mostly out of the mud. he has found a nice perch to show off his magnificent feathers, Ray. Ray: I made peahen "show me what you got, Big Boy!" noises, but he refused to display, Ayush.